Can someone help - not being tech savvy - I need help in simple terms. I can't sync evernote from my android device due to insufficient memory. I remove all photos on a daily basis and have an internal SD card for that purpose. Aside from emails and text messages - very few other apps on phone. I removed Evernote from my phone a few weeks ago but when I reinstated it and it started loading again - I had the same problem. I had the same problem with my Samsung Optimus. Finally gave up and deleted Evernote. The problem was caused because Evernote cannot access the huge amount of empty space on my SD card. I run Google Keep on the phone now. Are you using offline notebooks? That would lead to increased usage. Are you certain that Evernote is using space on your SD card? I was pretty sure that they didn't do that. I do use it offline - because I want access to it sometimes when I am out of the office. How do I turn it off? If this is the case, I am happy to just send to it from out in the field and make sure I can access from office. I do use a lot of photos and like to send them to clients whilst I am onsite - I worked out how to minimise the photo sizes and have since learnt not to take too many photos. I haven't been able to get the Evernote program onto the SD card which someone suggested I should do. There is plenty of space on the SD card if I can do that. The app designers need to update the app to allow it to be moved to external SD. Period. Eating up our internal space for no good reason is unacceptible. At the very least let us put the DB out there! You're going to lose people, guys, and I know I'm not going premium until this mod is made... I mean, why pay money for an app I may have to uninstall just to get a huge piece of real estate back? Offline notebooks are a premium feature: you shouldn't be losing storage permanently in the standard (non-offline) case. Notes get cached, but can be removed by Evernote as needed (not sure of the algorithms). Premium users who use offline notebooks need to be careful not to overcommit, however. Probably a good idea for Evernote to implement SD support, but non-premium users shouldn't be having this sort of problem -- if you are, then you should probably be checking in with support. Not really a solution to your direct problem but I have found that Papyrus is a nice piece of software to use on the Note 10.1 - it ignores your palm and stuff like that and you can either save to Evernote or set it to sync the Dropbox and then set up a IFTTT rule to copy to Evernote automatically. I have read same problem, I want to move Evernote from internal to my external card. I had to delete the data to free up space,. I am a standard user also. What I do not understand is why the user is not even given the option to move the app offboard. The bloatware included with the device is bad enough, it seems to me giving the user the ability to move any downloaded apps, as most do, should be a "best practice". What about 'App 2 SD'? As far ss I know, this App can move your Evernote to SD. But: the widgets dont work aftewards, so you have to do a few more clicks to create a note. Thanks, Olli. Are you talking about "App 2 SD" that's in the ZDbox? or a seperate app? Within ZDbox, Evernote does not show in the moveable list. I have a Note II too and so I' m interrested in a solution as well. So I looked this up. You are right. On some Samsung Devices App 2 SD don't work. The only other solution I can think of is rooting the device -but this is for very experienced Users and nothing i would recommend for everyone. Thanks, once again, for your reply and verification. I've made the circuit around various forums, learning what I can about rooting. I do have a "spare" tablet, but I have it because I just repaired it, and am not sure I want to risk bricking it right away. I recently bought Samsung Galaxy Note III, and I find it's S Note app delightful. It has an integrated support for syncing notes with Evernote, but, when I sync them, Evernote descales them, and reduces it's quality (I presume for reducing storage cost). So the note becomes pixelated and blurry (see atachments). 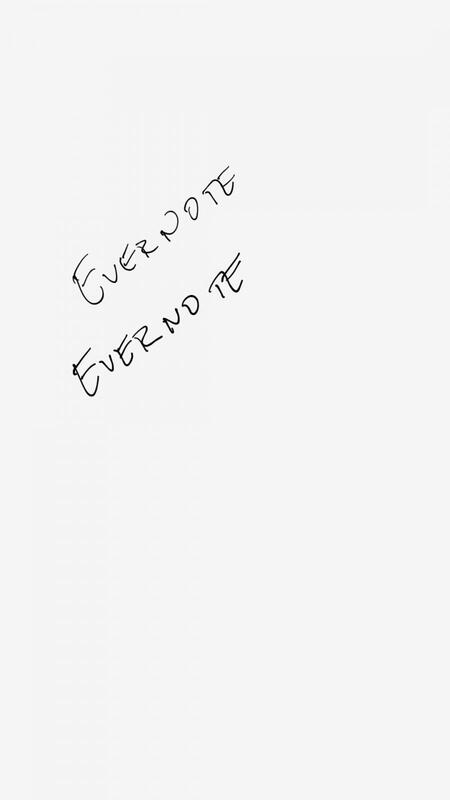 To your knowledge, is there any way, a setting or a preference to make Evernote keep the original quality of the note? Don't know of any setting in Evernote to change that; how about S Note support? I've just upgraded my phone to a note3 and noticed it has evernote integrated into Snote. What I want to do is make notes on the note3 using snote then work on my Windows8.1 laptop and amend, add to notes etc. When I try this though it is telling me that I need to use the app to make changes, which I presume means using snote to do this. I know I can just use evernote on my Note3 and do it that way but I like the way Snote works with the note3 and would ideally want to edit notes made in snote on my windows8 pc. how about S Note support? There is no such setting in the S-Note app either. Thanks, they are in a bit of both, text and writing, will give that search a go thanks. It seems a real shame as the sync with evernote from the snote on the phone works really well and would make it perfect if you could amened/add from the computer. I'm guessing Evernote can't edit the written content. Try creating another note with your comments/ changes and then merge the two? You could certainly use this for additions. Check settings on the S-note side of the fence, but I don't believe there really is an option to alter how it appears on the Evernote side of things. Hopefully that makes things a little clearer. After a fast google search through the evernote forums, I've found that the resolution issue is a current issue between Samsung and Evernote. Hopefully an update on either side will change that. I would also like to be able to edit my s-notes and LN notes directly in Evernote, in the app and on my PC. I would also like to handwrite my notes in EN, if that is possible. Might I suggest another way to deal with this? I have a Note 8 which is the half sized tablet with the s-pen. I noticed right away that if I used the Samsung keyboard with swype function, I could also toggle to pen function. It converts anything I write with the pen to text, and it works with almost all apps that require text input from me. Then I came across a note somewhere that indicated I could pick an app to open automatically when I pulled the s-pen out. Drilled down into settings and sure enough in the s-pen settings is a place to set that and it could be Evernote! So now I don't bother with the s-note app at all, I just make notes in Evernote (actually I never used s-note, I just opened Evernote and then used my pen). All this leads me to believe that most of the integration of this great extra on Notes is going to come from the Samsung side not the app side. I know that doesn't help you if you have an older Note that won't do this, but for newer Notes, this is a great integration that is getting easier and easier to use with everything. I have the Galaxy Note 10.1 2014 and utilize SNotes for work. I recently found that Samsung has created an SNotes program for Windows that will sync across all your devices. For me this includes my Galaxy Note, PC, Laptop and Galaxy S phone. Simply log in with your Samsung account on all the devices and you are done. Everything is ready and available. It is very handy being able to take notes in a meeting on my tablet and then clean them up at my desk. You can easily export the note or copy and paste into Word for project tracking. Where can I find the program on the web? can you post a link? This worked for me when I got my Galaxy 10.1 and that's exactly why I spent the money on it. Now it doesn't work the same. All notes are scratchy and hard to read and not searchable. Can anyone help me? Evernote tech support (I'm a paid subscriber) just tells me I found a bug. But no solution. The pixelation issue seems to be solved. I can now write text in S-Note, and view the handwriting. The handwriting is also searchable. They still do not play perfectly together. 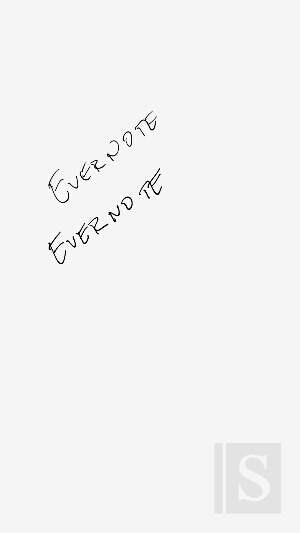 You still (of course) can't use Evernote for Android to edit handwriting made in S-Note. Also, the killer for me, is that the note is not directly editable in Evernote Windows. Each page of a S-Note note comes across as a separate image (.jpg) in Evernote Windows. They are "annotatable" using Evernote Windows; but only as a copy. This means, if you would like to edit an image, it creates separate note with the edited image on it's own. There is clearly not a technical reason for this. Evernote Windows could implement the same functionality as they do with it's current handwriting functionality which is also editable only as a .jpg, but directly in the original note. This is still enough of a reason for me to use Evernote's handwriting. That's a shame because I really would like to use S-Note. The handwriting experience is far superior than Evernote's equivalent. The fact that it can ignore your palm and only recognize S-Pen is awesome. Hopefully, Evernote and Samsung are still looking at this as a work in progress. Clearly progress has been made thus far. [samsung Galaxy Note 4, Android 5.0.1, S Note 4.1, Windows 8.1, Evernote for Windows 5.8.5.7193 (275193) Public]. So why not make notes in Evernote on Android using the handwriting selection there? Yes, it is not S-note handwriting, but it is editable and it is editable on the desktop platform. Are S-notes editable on Windows desktop without Evernote? I don't know. My palm seems to be ignored in Evernote using the S Pen on my Note 8.0. Once the pen is away from the screen and the "bulls-eye" disappears then it registers any touches. That's unfortunate it isn't working the same for you. My workflow was going to be S Note then share with Evernote, but it doesn't seem to be searchable which is critical for me, and not editable within Evernote. You can mark up with Skitch. For my purposes, writing directly in Evernote seems to be the solution. CORRECTION: Using Share via > Image file (.jpg) does become searchable in Evernote, but there seems to be a long delay. Interesting. I wonder if JPG takes longer for the Evernote search to process. In Papyrus, using Export > PNG is searchable right away but not the JPG. I have found that sharing INKredible notes (no transparency) with Evernote is searchable but not editable within Evernote. You can mark up with Skitch. I learned from a post on this thread that if you use the Samsung keyboard, you can switch to pen mode and it will convert your handwriting to text. For plain text notes, this is wonderful! It recognizes my script quite accurately. I attached the note I created the day I bought my Note 4 below. It is not perfect, but definitely legible (unlike yours). I remember thinking, at the time, it was very low quality, but I did not get a screenshot or anything to be able to compare. I do use Evernote's handwriting. I haven't used S Note except the few times I have tested its compatibility with Evernote. It failed to meet my needs and I am forced to use Evernote's inferior but perfectly capable handwriting function. S Note has many more options available where Evernote provides the minimum. Evernote's handwriting has a single line thickness for a given pen-stroke, where S Note simulates a more natural pen stroke by detecting the pressure placed at its tip throughout the pen stroke. It is incredibly sensitive and accurate, but only with the S Note app. It also has several writing instrument options (pencil, pen, etc. ), not just pen thickness. By not being able to use S Note, the S Pen itself becomes limited. I am a fan of Samsung hardware, but I generally hate almost all of Touchwiz and apps which came with the phone, and use alternatives instead. The S Note + S Pen interface is something they have done well. It would be great to be able to use it. Also, handwriting created in Evernote is not exactly editable on the PC. It is only editable as a picture. Then after editing, it is never editable as handwriting again. This is still fine for me. If notes created in S Note worked the same way, it would be enough to allow me to use S Note. It seems like it is a very easy thing to accomplish. I have found that sharing INKredible notes with Evernote is searchable but not editable within Evernote. You can mark up with Skitch. You're right. I didn't realize it worked that way. S Note has a special option for it, but I'm guessing it ignores everything except S Pen regardless of the "bulls-eye". I hope you have it working for you now. I made a correction to my earlier post. When I shared an S Note in JPG format with Evernote it was not initially searchable. I was testing another note taking app, Papyrus and did the search, voila, the S Note attachment was searchable. I wonder if the JPG format just takes longer for the "engine" to make it searchable. This still does not solve the inability to edit within Evernote but now opens the door to using the richer features of S Note. I'm pleased! the problem- i have set up evernote as the sync server, the notes made on my pc snote show up on my mobile via evernote, but notes that i made in my mobile snote do not show up in pc snote even though the evernote sync is working. at present i have to copy the snote file from my evernote client to my desktop to open it in my pc snote client. but thats just a copy not the original note. when opening pdf files on right clicking the note in evernote it gives the option "open with" from which we can choose adobe foxit etc. same way they can also give an option for spd (snote format) to open it in snote pc client. so any of you guys any idea around this problem? I don't use s-note. I take notes with the S-pen directly in Evernote. Works great. I missed this point when it was first made. So I am late to respond. Sorry about that. I guess what I don't understand is why have your notes left in a handwriting format? When I take notes with my s-pen, I have it set to convert, as write, my handwriting to text. Why not do this? This is much easier to use and unless you have amazing handwriting much nicer if you want to share your notes. I wrote this post doing this exact thing. I guess what I don't understand is why have your notes left in a handwriting format? When I take notes with my s-pen, I have it set to convert, as write, my handwriting to text. Why not do this? The handwriting keyboard (i guess that's what you meant)is extremely slow in real world situation. Like taking meeting notes in a large meeting. Taking hurried notes of what professor is telling in the surgery ward, quickly jumping from patient to patient. So a pen and paper like experience like snote and onenote is the only practical solution. Snote is as good as onenote when it comes to inking. But when you want the ease of syncing between devices that comes with onenote, you need the combined power of both evernote and snote. The problem is in the windows 7 snote client, evernote syncing is fine. Snote pc notes only sync oneway and samsung's support was disappointing, the indian staff closed the chat window as soon as i mentioned that the problem is software, they seem to be only concerned about selling hardware and have orphaned the great software that snote is. Anyways once i get free upgrade to windows 10 home which can convert onenote inking in android to text once synced to a windows onenote desktop client, I am going to shift to onenote for note taking on my note3. I will convert my onenote inking to text And will use evernote for permanent note storing directly from desktop (copy paste) directly because of unlimited storage that evernote gives. I will by pass snote and evernote android client completely. Though if i was a native English speaker i would have missed evernote android dictation capability but since i am permanently moving away from English i don't need it. Samsung has let me down. But i still consider snote a very powerful tool because you do not need internet to sync snotes. As snote is independent fileformat that can be moved around even in a pendrive or via bluetooth or via manual sync i.e usb drive. Samsung has let me down. But i still consider snote a very powerful tool because you do not need internet to sync snotes. As snote is independent fileformat that can be moved around even in a pendrive or via bluetooth or via manual sync i.e usb cable.